On a non-work Monday I usually spend my afternoon playing Xbox360 games or reading, or some other enjoyable but ultimately profitless way of passing time. Today I decided to focus on cleaning up my 'to be read pile' where I came across a whole pile of articles on the Environment. This is something I take very seriously - both at home where we recycle and do everything else we can and at work where I am a champion of environmental thinking and also a Chartered Environmentalist. This afternoon I have been I have been looking into various campaigns for the Environment. 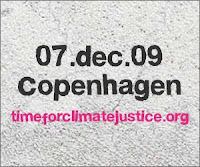 Climate change is a huge issue - never so more than now as later this year the UN meets to decide on what follows Kyoto. Go to this site and join their petition which is taking the form of a giant human clock with everyone contributing a second (a "tck"). You can upload a video, picture or use thirty characters of text. Also there is the site 350.org. This is another superb site - whose action day is 24th October. 350 chosen numerically as it is transcends language; 350 the number chosen as this is the aim for parts per thousand of CO2 in the atmosphere. Last but not least there is Blog Action Day on the 15th October whose theme this year is climate change. All you need to do is blog on the topic on the chosen day. Call back here on the 15th for my contribution! All of the above are about raising awareness, you don't need to do any of these to take part. Switch out the lights next time you leave the room. Turn of your computer monitor when you walk away from your desk. Only boil enough water for the drink you are making. Do your laundry at thirty degrees. Turn off the tap whilst you clean your teeth. Install a flush saving device in your toilet cistern. Use canvas and re-usable bags when you next go shopping. Leave the car at home and walk or use public transport. I used to think when I first heard the term that 'step change' was a gradual change in the way things are done - in fact it is the opposite. It is rather a quantum leap, or a paradigm shift. The thing is it is time to do away with the old ways and look for the new... environmental responsibility is now the responsibility of everyone!